Do you need a last-minute, shockingly simple treat for New Year’s Eve? This recipe came in the latest issue of Cook’s Country as a viable option for a dressed up Valentine’s Day treat. I wasn’t going to wait two months to make them so I whipped them up this morning for a friend’s birthday (and saved leftovers for our New Year’s Eve) and they are fantastic! Basically, Cook’s Country revamped the traditional rice krispy treat – making them creamier (thanks to the addition of white chocolate with the melted marshmallows), classier (thanks to the drizzled chocolate and mix-ins) and altogether yummier (thanks to a heftier ratio of marshmallows to rice krispies). I’ve always loved rice krispy treats, but I don’t think I can go back to the old recipe again. Prepare pan by lining an 11X7-inch baking dish with foil, allowing excess foil to hang over pan edges. If you want the treats thinner, use a 9X13 – for thicker treats still use an 8X8-inch pan. I found the 11X7 pan size to be perfect – not too thick and not too thin. Grease the foil with nonstick cooking spray. Melt butter in a large pot over low heat. Add marshmallows, white chocolate chips, and salt and cook, stirring constantly, until melted and smooth, about 8 minutes. Stir in vanilla. Off heat, stir in rice krispies and cherries or cranberries until incorporated. Scrape mixture into prepared pan and press into bottom and corners with a greased spatula (I just used my fingers since the marshmallows weren’t overly hot at this point). Let cool completely, about 1 hour. Melt semisweet chocolate chips in the microwave on low at 30 second intervals until smooth. Pour melted chocolate into a ziploc baggie, pressing chocolate into one corner of the bag. Using scissors, clip a tiny piece off the corner and drizzle chocolate over cooled treats. Allow chocolate to cool, about 45 minutes. Using foil overhang, lift treats from pan. Cut into squares. Serve. Fluffer-Nutter Treats: Prepare Crispy Chocolate Cherry Treats, substituting 1/2 cup peanut butter chips for white chocolate chips, 1 cup dry-roasted peanuts for dried cherries or cranberries, and 1/2 cup peanut butter chips for semisweet chocolate chips. I make these all.the.time. I actually have never added the craisins though. I usually just make them “plain” but add the salt, white chocolate, and vanilla. Everyone raves about them. I love them and I can’t make “normal” rice krispie treats any other way. I have also tried the suggestion to swap the white chocolate chips for peanut butter chips. I didn’t add extra peanuts, but did smother them with chocolate. Amaze. If I want something other than plain, that is my go to. So divine. These look so delicious! I see that they’re in the Gluten Free recipe section and I just want to warn people that the malt flavor in the Rice Krispies cereal contains gluten, so I would recommend trying to find an off-brand gluten free version for those that cannot have gluten. Loved the craisin recipe and they were a hit at our family get together. Thanks! Jenn – oooh, awesome to know that the turtle variety turned out great. Thanks for making them and for letting me know! My kids love rice krispie treats. These sound great! Made the turtle variation tonight (minus the nuts–kids don’t like nuts). I think I like them better than the white chocolate ones! Those are the best looking Rice Krispie treats I’ve ever seen! They have to be delicious! Kali – thanks for the link to another great rice krispy treat. I bookmarked it – it looks delicious! Love these kicked up treats! I hope all is well! I looked at your blogg to late, or I would have made thses for tonight. I tried a different recipe for tonight. I have an overstock of rice krispies, so I’ll have to try these soon. The other versions sound fabulous also. I’m finding so many recipes on your blog that I want to try, I don’t know where to start first.These look soooo good. 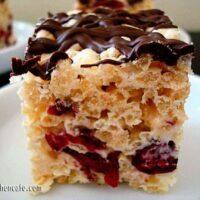 I’ve seen some recipes for Rice Krispies where they added in white chocolate, but the craisins & chocolate sound sooo good! Those are my kind of rice crispie treats. Your kicked up version looks DAMN good!! No baby yet? Have a happy new year! even the worst cook (and by that, i mean my dear brother) can’t mess up rice krispie treats, and you’ve done them up quite nicely here. happy new year, melanie! Stephanie – let me know if you try these! They are a change from the classic recipe but we loved them. fmandds – glad you liked these! And I bet they WERE fabulous with chocolate milk. I’ll have to try that next time! Made these this evening. Yum!! I’ve never been a real big fan of the rice crispy treats, but like this, how can I not be?Those turtle ones sound good too. I’m going to have to make those too, very soon. I’m new here and was browsing your recipes. This one looks great! I am a huge fan of rice krispie treats, but make the same ol’ back of the cereal box recipe every time. I’ll definitely have to give these a try! Thank you for sharing! 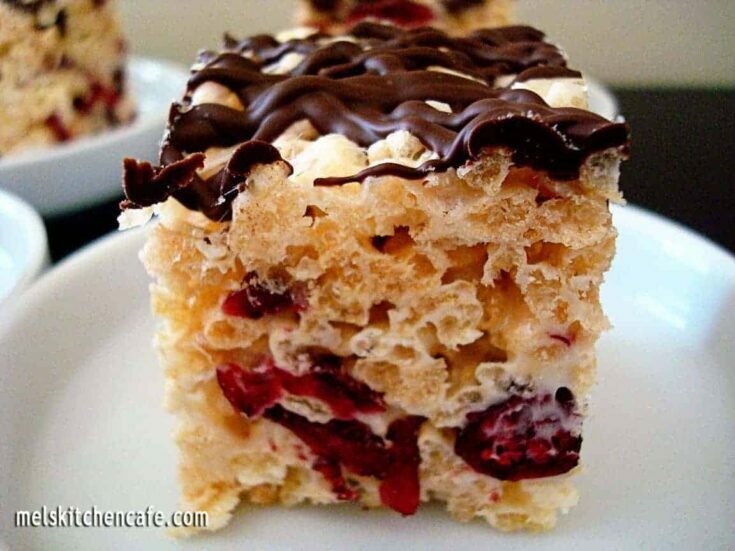 That is a fancy grown up version of the rice crispy treat. It looks great. Now I am having slight remorse for letting my subscription to Cooks Country lapse! I made the crispy chocolate cherry treats tonight and I enjoyed them. I couldn’t really taste the addition of white chips. I may try adding just a little bit more. These are definitely great rice krispy treats and went fabulous with chocolate milk. I love how simple Rice Krispie Treats are! This kicked up version is definitely going on my to-do list! Happy New Year! As I was looking at this post my daughter walked by and said “Yum – those look great!” We will be making these this week! !